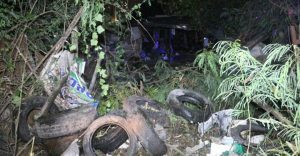 A FREAK accident in Pathum Thani province led to the death of a woman and the injury of 10 others after a Mitsubishi Pajero sport utility vehicle (SUV) rammed through the wall of a single house and then zoomed through and hit the wall of a second house, INN News reported this morning (Sept. 11, 2018). 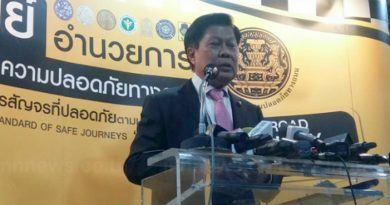 Pol Col Kiattipong Tibma, duty investigator at Klong Luang station, rushed to the scene of the accident together with a forensic doctor from Thammasat University Hospital, ambulances and rescuers, but found upon getting there that another group of rescuers were already helping the injured. 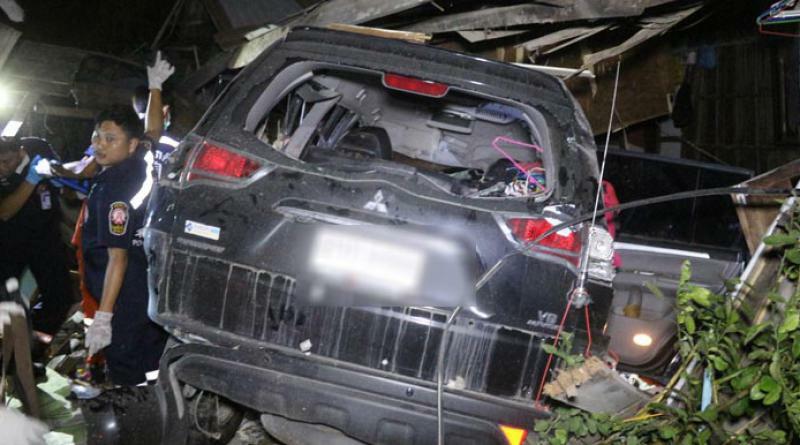 Lying dead beneath the vehicle at the 2-storey, half-wooden, half cement house was Mrs Benchawan, 40, and rescuers had to use cutting torches to dismantle the vehicle and bring out her body. 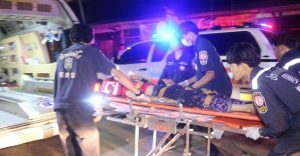 Mr Khom Sonphai, 52, said he was sleeping in the house when he heard a thundering noise with the dogs barking loudly and upon coming down he saw that a vehicle had driven right through his house. 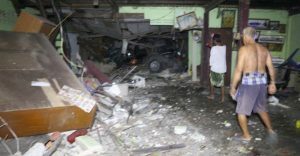 Mr Opas 43, who owns the house, said he was not home when the accident occurred but there were 5 persons living in his house, with the dead woman being his sister. He rushed back upon being informed of the accident. 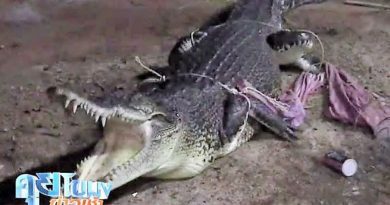 The SUV’s driver, Mr Phongsakorn, 30, said he and he relatives and friends, altogether 5 persons, had gone to attend a ceremony to honor teachers next to Wat Sangsan temple, and he was on his way to drop off his friends in nearby Ayutthaya province, and return to upper central Kamphaeng Phet province, when a pickup truck cut across the front of the vehicle. In trying to not slam head-on into the pickup truck, he had swerved but ended up knocking down this house’s wall and zooming straight through killing the woman and injuring the others.